If you are the mother or father of a young child, it is likely that you are well aware that you need to keep them physically active in some way or another. Plain and simple, children who are physically active are not only healthier, but they also will reap the benefits when it comes to social and other times of development over time. While many parents think that dance classes are solely an activity for little girls, we equally encourage boys to try out dance as well. This is because regardless of the gender of the child, dance offers a number of wonderful benefits. If you live in the Palm Beach Gardens area and you are looking for the right dance studio to enroll your child in, it’s time to check out Dance Obsession Dance Studio or continue reading below to learn more about the various reasons your child will benefit from dance classes. If you have a child who is a bit on the shy side, enrolling them in a children’s dance class is a great way to boost their confidence. Regardless of the style of dance, the performance aspect is what helps children to really grow their self esteem. As they begin to know the movements more fully, they will gradually begin to feel empowered each time the music starts and they start to move their body. If you have noticed in the past that your child tends to avoid other children at school or the playground, it is likely that you have considered how you can help to bring him or her out of their shell. One of the best ways you can do this is to enroll your kid in a dance class. Being part of a group dance class requires a lot of communication; not only with the teachers but also with the other children in the class. Your child will have to learn over time how to work together with the other children as a team, aiding in them developing strong social skills. You probably already have a pretty good idea of the positive effects dancing can have on a person’s physical health so it should be no surprise that when you enroll your child in one of our classes that both their strength and flexibility will increase. Every style of dance incorporates movements that allow for these improvements to take place. This means whether your little one wants to try our ballet, tap, jazz, or another one of our classes, they will be getting healthier at the very same time. When a child is exposed to the arts at a very young age, it aids greatly in their growth and development for the rest of their life? In a dance class, your child can learn all about how to move their body and what sorts of creativity is needed to build a choreographed routine from the ground up. This exploration of non-verbal communication is a place in which your child can lose themselves in the deepest chambers of their imagination. When Can You Enroll Your Child? 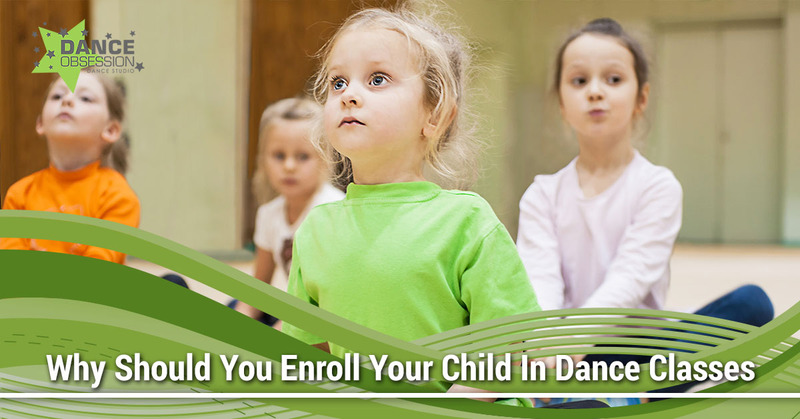 If you are ready to help your child to begin reaping the rewards of being enrolled in a dance class, don’t wait any longer. We have seen drastic growth in nearly all of our students who have stuck with their dance classes over the years. And as a parent, we know it is your desire to make your child the best and most well-rounded person you can. Enroll today and find out when your child can attend their first class at Dance Obsession Dance Studio in Palm Beach Gardens!